Get your custom etched or cast metal plaque from Gemini Sign Letters in 21 days plus shipping time. Recognize an individual, capture a historical footnote, or dedicate a building – elegantly and permanently – with a bronze or aluminum metal plaque from Gemini Sign Letters. Ideal for professional offices, university and government buildings, and commemorative uses, etched and cast metal plaques are available in 14 different finishes, including polished, painted, or oxidized. 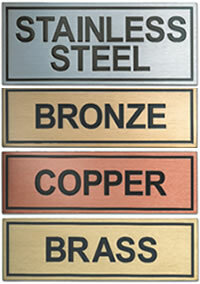 Using only the purest, lead-free alloys, cast and precision tooled plaques are available in various depths. For a sense of permanency and architectural depth, consider the classic look of a precision tooled bronze, brass, or aluminum plaques, logos, and emblems.